Your precious loved one coughs, sneezes and has a runny nose. Unfortunately, with these symptoms, your baby may have a cold. According to the American Academy of Pediatrics (AAP), the common cold is caused by rhinoviruses and is the most widespread illness in the United States. UptoDate, a clinical decision tool, notes that infants and young children are affected by these viral illnesses more often, and experience symptoms for longer periods when compared to adults. Symptoms of a cold usually develop one to two days after being exposed. Wong's Essential of Pediatric Nursing states that the first sign of a cold is typically nasal congestion or clear, yellow or green-colored nasal discharge. Cold symptoms are generally worse during the first 10 days and it is not unusual for babies to continue to have congestion, runny nose or a cough beyond 10 days. Symptoms are often more severe in infants and young children when compared to adults (p. 759). Fever (temperature higher than 100.4°F or 38°C) is common during the first three days of the illness. Is It a Cold an Allergy or Something Else? It might be hard to determine if your baby is experiencing a cold, the flu or something else since the signs and symptoms are so similar. Cold symptoms are generally milder than those of the flu, and most of the time, they clear up on without antibiotics or other interventions. Normally, colds do not progress to serious illness in children and a cold rarely has a fever above 101 degrees. WebMD notes that the flu may start out as a harmless viral infection but your baby may suddenly display have a lack of energy and have a sudden onset of a fever and chills. The flu can quickly progress to pneumonia or even death, particularly in children. Most symptoms will improve two to five days after disease onset but don't be surprised if child is not back to their playful and happy self for a week or more. If you are at all concerned about your child's symptoms, see your pediatrician, so she can assess your child's condition make recommendations on how to treat the condition. Runny nose: If your baby has just suction or blow it. Antihistamines (e.g. loratadine or cetirizine) do not help a cold, but they are useful and help if a runny nose is caused by nasal allergies. Stuffy nose: Use saline drops or nose spray to loosen secretions. Follow up by carefully suctioning your child's nose with a bulb syringe to remove drainage. The AAP recommends using nose drops before a bottle or breast-feeding your infant to help them breathe while eating. Sticky, stubborn mucus: Remove using a wet cotton swab. Coughing: To help ease your baby's cough try giving him some clear fluids such as water or apple juice. UptoDate indicates giving warm fluid such as warm water may have a soothing effect on the nose and sinus cavity thus, increasing the flow mucus and loosening secretions making them easier to remove. Fluids will also help to prevent dehydration. For babies 3 months to 1 year of age, the AAP suggests providing clear fluids if your baby is coughing. Honey should not be given. If your child is younger than 3 months old, you should visit her health care provider for recommendations. Honey can be used to thin the secretions and improve cough symptoms in children 1 year and older. Humidity: Using a humidifier moistens the air and keeps your infant's nasal mucus from drying up. It also helps lubricate your young one's airway. If you do not have a humidifier, try running a warm shower so the steam will help to humidify the air. Fever: It is best to only treat a fever if it is interfering with your baby's daily activities or causing him discomfort. This usually doesn't happen until his temperature reaches 102F or higher. Use acetaminophen (Tylenol) or ibuprofen (Advil or Motrin) to treat pain or fever. For babies 3 months or younger, contact your health care provider immediately for a temperature of 100.4 degrees or higher because they are at greater risk for more serious complications. You should treat cold symptoms only if they are causing your infant discomfort, interrupt sleep or are interfering with her everyday function. The best way to keep your baby healthy is to wash your hands often with soap and water and encourage others in your household to do the same. Using an alcohol-based hand sanitizer can also help to stop the spread of the cold virus. 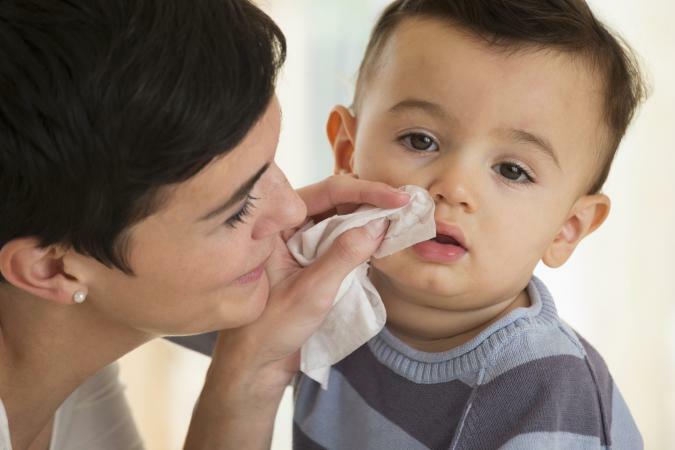 Having a cold can be an unpleasant experience for you and your baby. By implementing simple preventives, you can keep your baby happy and healthy.